Have you ever desired to work from home? •Why setting goals is important. •How to set a budget for your business. •Which niche is right for you. •What your value is and how to get paid what you deserve. •Inexpensive ways to market your business. •How to create systems that result in good customer service and client communication. •Time management techniques that work. •Go to resources you cannot live without. Alyssa started her VA business in 2007 and she is sharing her secrets. 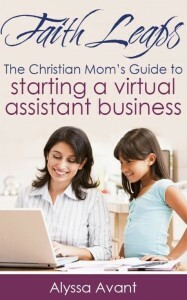 By the time you finish this book, you'll have taken the first 10 steps towards starting your own virtual assistant business. What are you waiting for? Take action, today!